Cast Of Stemmed Point From Auvernier Site, Switzerland. 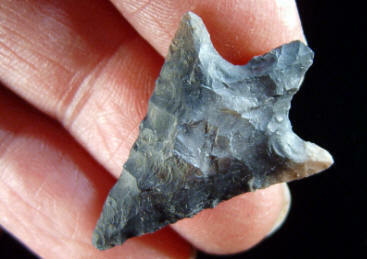 This arrow point was found on the Auvernier site in Lake Neuchatel in western Switzerland. The Auvernier site is a lake dwelling site that dates approximately from 4,000 BC to 500 BC. This stemmed point dates sometime between the Middle Neolithic period to the Early Bronze Age. Stemmed arrow points are found on Stone Age sites in many areas of the world. They represent one of the more common forms of projectile points. Ferdinand Keller illustrated three different shapes of arrow points in his book on Swiss “Lake Dwellings,” and refers to this style as "the most artistic of all." Some examples of stone arrow points were found still attached to a shaft with pitch and “thread.” This point is made from good quality chert and it measures 1 5/16 inches (3.3 cm) long. 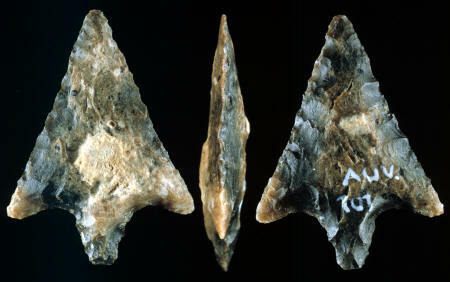 This picture shows three views of the original stemmed arrow point from the Auvernier site in western Switzerland.